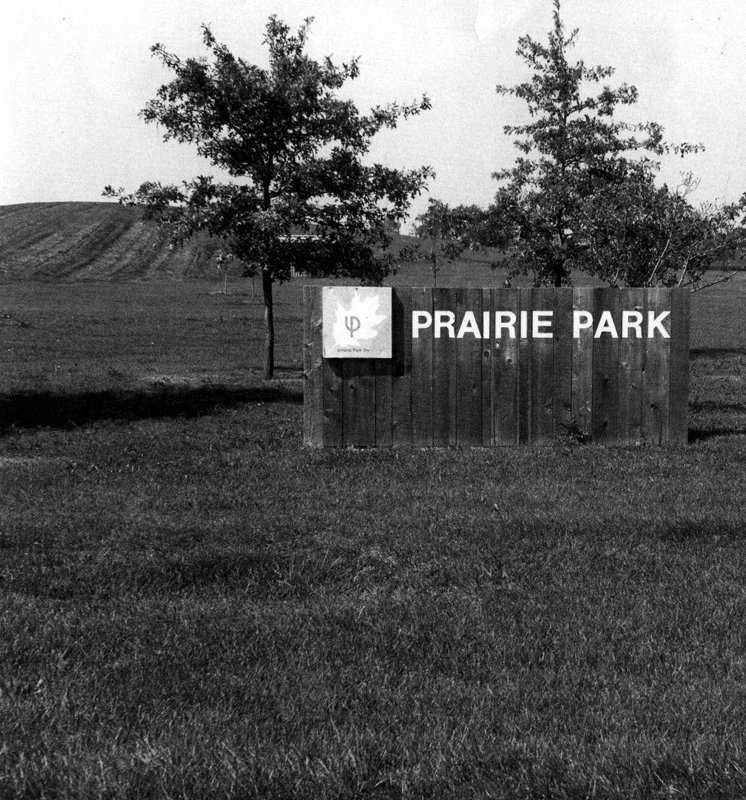 Established in 1967, Prairie Park spans 20 acres. Prairie Park, located along East Washington Street in Urbana, is home to many of the district's athletic programs in 2007, including baseball and softball. It is also representative of the many ways the Urbana Park District and Urbana School District 116 cooperate, as the Urbana Tigers baseball team plays all its home games at the ball field due to space limitations on the high school campus. In the early 1900s, the 20-acre site formed part of the Champaign County Poor Farm, which at one time covered more than 100 acres. Indigents and others unable to make a home elsewhere tilled the ground to grow food used to feed farm residents. After the county decided to close the poor farm, the acreage became available for other county uses. The park district paid $63,000 in 1967 for 20 acres. In 1968, a master plan was proposed to link two schools and the park along a 60-acre stretch of East Washington Street. Eventually that was what happened, although not on as grand a scale as originally envisioned. The grand proposal, as outlined in newspaper articles, called for a 20-acre junior high school campus as the western anchor for the site, a 20-acre tract with Prairie School anchoring the eastern endand a 20-acre park in the middle-that's what became Prairie Park. The park was to have numerous athletic fields, an earthen mound that would serve as backstop for an archery range, and several other features. The site that eventually became Brookens Junior High School, and then Champaign County's Brookens Administrative Office building, was to have a football field northwest of the school. A park district swimming pool was proposed for the site, but voters did not approve a tax increase/bond issue in 1972 that would have been required to pay for a swimming pool and other projects throughout the park district. the winter-was created with dirt excavated when East Washington Street was improved from a blacktop to a concrete thoroughfare. Being one of the few '"hills" in the area, it also has become a regular portion of some competitive cross country running courses. Volunteers from the International Brotherhood of Electrical Workers installed the lighting for the baseball field, which has been used by Urbana High School and park district youth baseball leagues. However, the other ball fields never were built. 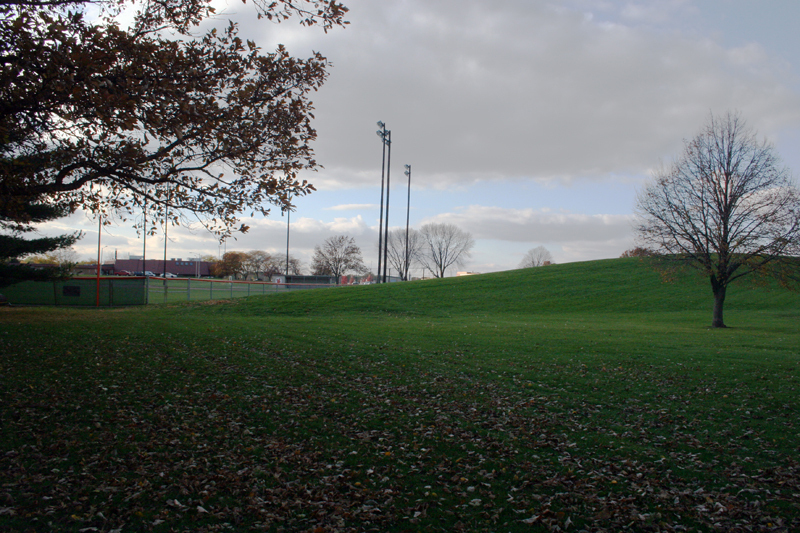 Soccer goals are on the open grassy areas to the north of the sledding hill. A few picnic tables dot the site, and open areas around the Champaign County Administrative Offices have soccer fields. One historical note of interest is that the expansion of East Washington Street meant the persons buried in the poor farm cemetery had to be reinterred. A small plaque east of the county building marks the site where the remains in the cemetery were reburied in an ecumenical service during the early 1970s. In 2006, plans were approved for Weaver Park, which adjoins Brookens Gym, Prairie Park and Prairie School as well as the newly constructed Champaign County Nursing Home. Prairie Park will become part of an even larger park complex when Weaver is developed in coming decades. Prairie Park welcome sign: Image courtesy Urbana Park District Published in Mancuso, Dana L. (Ed.). (2007). A century of growth: the Urbana Park District's first 100 years. Urbana, IL: Urbana Park District. 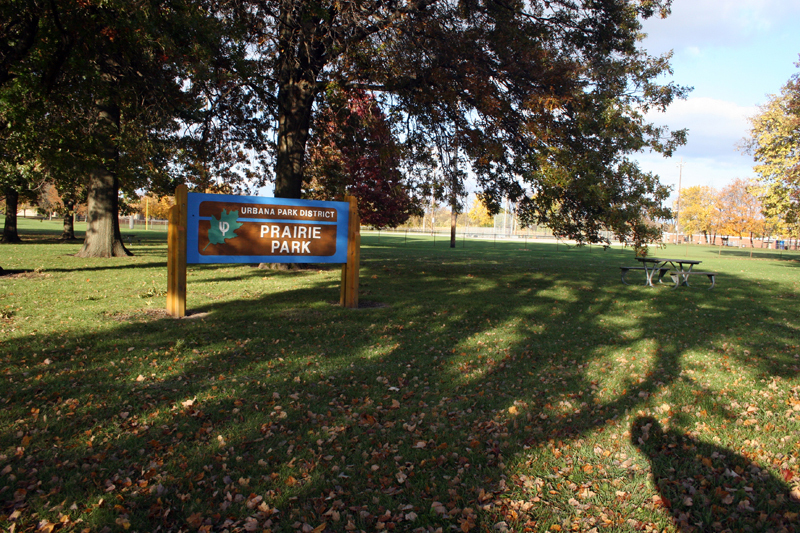 Urbana Park District, “Prairie Park,” ExploreCU, accessed April 21, 2019, https://explorecu.org/items/show/161.